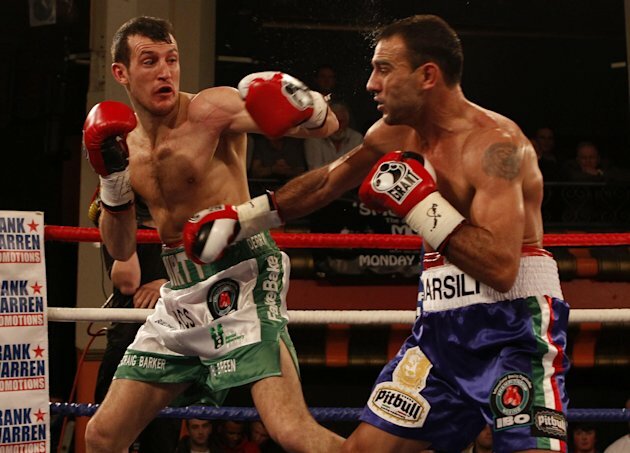 Derry Matthews was subjected to a brutal defeat at the hands of the undefeated Emiliano Marsili, who claimed the vacant IBO lightweight belt in Liverpool. The Brit was left a bloody mess after being knocked down by the Italian southpaw, who extended his unbeaten record to 24 fights in claiming the 10th knockout of his career. Fighting for his first world title since losing the WBU featherweight belt to Choi Tseveenpurev in 2008, Matthews was stunned by Marsili's brutal combination of speed and power as he was emphatically beaten at Liverpool's Olympia. Matthews, who suffered a broken nose against Gavin Rees last October, suffered a number of clean punches to the face and was bleeding heavily as the Italian southpaw continued to target the Brit's nose. Matthews looked a beaten man as fell to the canvas after a body blow from Marsili in the sixth. He beat the count to continue, but the referee stopped the fight in the seventh after a relentless assault from Marsili. "I thought I hurt him but he came back, he's a warrior," Matthews told Box Nation. "My nose went in the first round, well, it went in sparring but I'm a Scouser and I love fighting. I'm not making excuses, I worked my b******s off. Marsili beat me." "I am the champion of the world," Marsili said. "I want to defend the IBO and unify it with the other championships."